Virtualization management is software that interfaces with virtual environments and the underlying physical hardware to simplify resource administration, enhance data analyses, and streamline operations. Each virtualization management system is unique, but most feature an uncomplicated user interface, streamline the VM creation process, monitor virtual environments, allocate resources, compile reports, and automatically enforce rules. Some solutions even integrate across hardware and software brands—allowing users to install the management system that's best for them. Depending on how big and diverse your environments are, how experienced your IT team is, and what your strategic goals are, virtualization management software might make your life a lot easier. Sure, a single system administrator can manually manage a handful of virtual machines (VMs) fired up on a single workstation, but large enterprise-wide deployments use virtualization management software to help their systems be successful. That's because VMs aren't just provisioned automatically when hypervisors are installed—someone needs to tell the software what to do. That usually includes a combination of 4 responsibilities, which multiply each time a new VM is fired up. Processing resource requests, creating templates, and configuring VMs. Securing and monitoring systems, identifying issues, and validating user access. Retiring or reclaiming unused or underused physical resources, investigating bugs, and projecting future needs. Implementing the other 3 responsibilities across virtual, private cloud, public cloud, and container environments. Traditional virtual environments are pretty straightforward—they contain physical hardware and VMs. But even these can get unwieldy if there are too many instances. What if outlets, faucets, and locks were synced to an app that automatically turned the lights off, locked the doors, and checked pipe flow in empty rooms after guests checked out? It would save you from climbing every step, traversing every long hallway, and opening every door just to perform a few simple tasks—freeing you to solve major maintenance issues that can’t be automated. In this analogy, every room is a VM. When simple maintenance tasks are spread across hundreds of instances, it becomes unwieldy. Management software can take some of that burden off IT professionals’ shoulders so they can solve big, enterprise-wide problems. 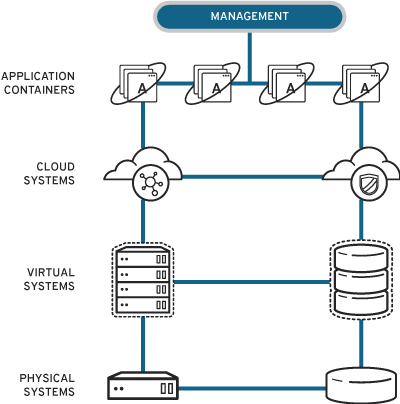 Hybrid environments consist of 2 or more interconnected virtual, containers, private cloud, or public cloud environments. These setups are far more complex than traditional virtual environments, since each responsibility is repeated in its own unique way. Imagine all the parts of a typical entertainment system: TV, cable box, sound system, and a few gaming consoles—each with its own remote. But nobody’s ever said that handling multiple remotes is an ideal situation. Rather, it’s something we just tolerate until we spend the time and money on an app that manages the entire system from 1 interface. The same goes for hybrid environments: Private clouds are secured differently than public clouds, and commissioning VMs is different than commissioning containers. Pair that with your unique business situation, IT stack, and experience level, and you have a lot to consider when it comes to choosing the right management tools. But the right tools do exist, and the best of them unify heterogeneous environments in a vendor-neutral and scalable solution—giving IT admins greater efficiency without increasing operational expenses. Because it’s a lot easier to deploy the right management solution when every option is available, and that’s what open source technology allows. But if you’re contractually bound to a vendor that restricts access to source code, you’re limited to either what’s compatible with the vendor’s virtualization platform or time-intensive workarounds. Such overreliance could force you into increasingly expensive enterprise-license agreements that keep you from deploying the ideal management tools and technologies. We believe enterprise virtualization should be open—period. So go ahead: Inspect, modify, and enhance the source code behind our technologies. With products trusted by more than 90% of Fortune 500 companies,&ast; there’s very little you can’t do with a virtual infrastructure built on our products and technologies. Install it on anything—from bare-metal hardware to open source or proprietary systems—and start deploying virtual machines by the dozens or hundreds with a hypervisor that can handle it and a management platform that makes it easy. Manage Red Hat or third-party virtualization platforms, private clouds, public clouds, containers, software-defined networking environments, and software-defined storage platforms. Our strategic advisers help you get from where you are to where you want to be using comprehensive, cost-effective solutions.